The cold season is here, and the Christmas celebration is close. We all start thinking about this magical time of the year when we offer presents to those we love. Your house smells like cinnamon, oranges and hot cocoa and you are ready to put up your Christmas tree. But why not try out some alternative Christmas tree ideas instead to protect forests? These alternative Christmas tree ideas do not only look spectacular, but they are also eco-friendly, creative and easy to make. You could transform this into a new Christmas tradition for you and your family. In what follows, we will provide you some alternative Christmas tree ideas so you can have a Christmas tree in every room of your house if you feel like it. Your kids will be thrilled to see their handmade woolen decorations and ornaments hanging from the chalkboard tree they’ve drawn. You can make this colorful yarn garland in no time, being easy to develop for kids of all ages. After you draw the tree, you should carefully string it across the graphic tree. If you want another type of tree, you can reuse an old piece of plywood lying around in your garage. Just cut it in a triangular shape, like a Christmas tree. Then, stick it against on the wall, in the living and ask Santa to leave all the presents there because you’ve been good the whole year, specially with all the recycling. You can even ask the kids to decorate the tree with the Christmas cards you’ve got in the previous years. This does not only look remarkably spectacular, but it is also easy to make. Make sure you have a strong adhesive in your house and start arranging your tools. Since during the winter season you will not use your garden tools too much, you can use them to develop an eco-friendly Christmas tree. You can either hang them or stick them. Then, add garlands to offer it a festive touch. If you have some old China lying around your house, that you haven’t used in a while, it is time for you to find a new purpose for it. Consider repainting it with a single color and then arrange them in the shape of a Christmas tree on your bookshelf. Furthermore, to add a Christmassy touch, you can put some colorful bulbs in the glasses to complete the effect. Who said you need a fir tree to feel like Christmas is coming? This exquisite and wall-mounted tree can be even more glamorous. You will need some MDF trim and fabric, and you will be able to develop something resembling a Christmas tree in a small space, around the living room. Try to add some garlands or matching bulbs as decorations. If you have some paper doilies, you need to try this out. These lacy winter trees look amazing! You will need some skewers or sturdy twigs and hot glue. You need to cut a wedge out of a round doily and then bring the cut edges together to develop a cone. Keep in mind the fact that the size of the edge will determine how narrow the cone will be. Then, you will have to glue the cone together and slide onto the stick. Make sure you also glue into place and then you can add more cones in decreasing sizes to develop a layered tree. If you decorate your house, why not decorating your front yard as well? Consider developing an eco-friendly Christmas tree using plank wood to create a rustic Christmas tree. You will only need some nails and a hammer to set the plank wood in place, arranging them in decreasing size. Put up your Christmas lights, and your recycled Christmas tree is ready. If you still have some pieces of wood from when you have redecorated the house, consider painting them in different colors. Then, cut them into different sizes and nail them to a bigger wooden plank in the shape of a Christmas tree. If you live by the beach and your Christmas is usually sunny, then your Christmas tree should match the weather. 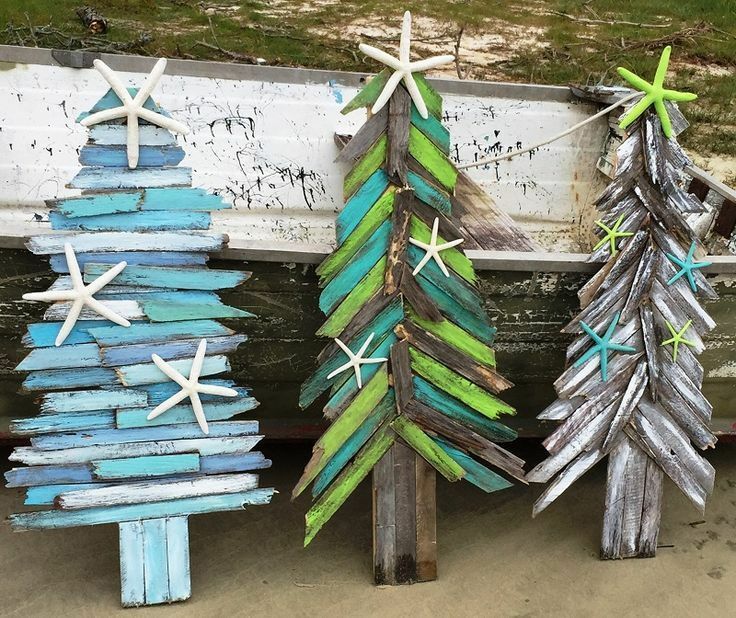 You will only need driftwood, adding some coastal flair to your Christmas celebration. Make sure you also hang some colorful bulbs, and you will have a classy and creative Christmas tree. This is an outstanding and unique Christmas tree. Use some peacock feathers to develop this tree that will be like no other. These jewel tones are seasonable without even being obvious. A coffee lover surely has a bunch of coffee filters in their house. If you are one of them, then you should definitely try this crazy idea. Take your coffee filters and dip them in green fabric dye. In this way, you will give them a nice ombre effect. Next, you should stack them to develop a quick-and-easy tabletop Christmas tree. If you have a collection of corks from all the bottles of wine you’ve opened this year, then you should consider reusing them. Use hot glue and put the corks together to develop a tabletop Christmas tree structure. When you prepare for the Christmas season, and you start cleaning the house and sort out old bills and papers, make sure you do not throw them away. Furthermore, if you have some old sheets with songs on it, you can use them all to develop a Christmas tree. This will surely stand out when you will place it on your Christmas dinner table. The book lover in you will surface now, and you should use your stash of books to create something resembling a Christmas tree. Decorate your miniature tree with old-fashioned string lights, and you will make it look amazing. All these alternative Christmas tree ideas can help you be more creative while also protecting the environment. Avoid cutting down a fir tree or buying a Christmas tree from the market when you can build your own by reusing some of the materials you own at home. Give this winter season a touch of green by protecting trees and using recycled materials.